Post those fundie conversion, spell request, turn my little brother into a frog, UFO, and just plain freaky emails you receive here. We can all critique them. Received this forwarded e-mail from a member of my son's scout troop. First the email, then the response I sent back to them. Removal of Joel Osteen, Joyce Meyer, Charles Stanley, David Jeremiah and other pastors from the airwaves. An organization has been granted a Federal Hearing on the same subject by the Federal Communications Commission (FCC) in Washington , D.C. .
Their petition, Number 2493, would ultimately pave the way to stop the reading of the gospel of our Lord and Savior, on the airwaves of America . They got 287,000 signatures to back their stand! If this attempt is successful, all Sunday worship services being broad cast on the radio or by television will be stopped. programs and Christmas carols from public schools! You, as a Christian, can help! We are praying for at least 1 million signatures. This would defeat their effort and show that there are many Christians alive, well and concerned about our country.... As Christians, we must unite on this. Please don't take this lightly. We ignored one lady once and lost prayer in our schools and in offices across the nation. Please stand up for your religious freedom and let your voice be heard. Together we can make a difference in our country while creating an opportunity for the lost to know the Lord. Now, please sign your name at the bottom (you can only add your name after you have pressed 'Forward' or you have copied and pasted the text). Don't delete any other names, just go to the next number and type your name. Please do not sign jointly, such as Mr. & Mrs., each person should sign his/her own name. Please defeat this organization and keep the light of our freedom of religion. those of you who don't know how to add your name - hit forward first and then just add yor name at the bottom and then forward it on to your friends. So many people do not know this and are forwarding it without their names added. Not a word said ,, but actions speak very loud. Romans 10:13 For " whoever calls on the name of the Lord shall be saved". the message to me to forward my reply back. First, I do not know the pastors mentioned in your e-mail, but find that several media evangelists should be removed for reasons that have nothing to do with their faith. who continues to throw anti-Semitic and anti-American comments at every opportunity. If we wish to use a classic example, we can look to Jim and Tammy Faye Bakker. People like this hide messages of hate, intolerance and greed in a "Message of Peace," and then seek protection like you offer to continue to do so. to influence other stations to carry what is tantamount to media missionary work. to me than to force a Jewish or Hindi student to sing "Away in a Manger." I couldn't have put it better myself, DW! First, I hid the email quoted above for privacy reasons. Second, fantastic reply. I must ask: Why do those who send out emails like this request it to be sent back to them? It's not the only hard copy in the world. I'm pretty sure they used up their resources in sending it out the first time. Do they just want an idea of who isn't on their crazyship? Third, Hytegia, when you call Dark Waters DW, all I can think of is Darkwing Duck! Trouble is with this kind of law, they tend to end up as a "catch all". Be carefull that it does not stop US from broadcasting as well. Depends how the bill is actualy worded, and WHO it actualy covers. 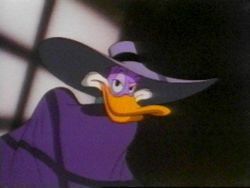 Crazy Healer Lady wrote: when you call Dark Waters DW, all I can think of is Darkwing Duck! Hey! It works for me. When there's trouble you call DW! The bill spacifically is worded toward people preaching "Hate" on the airwaves. That Darkwing Duck reference has been floating on the boards ever since Dark Waters JOINED! I think I can find at least two other posts that have it...ah, the persistence of strange childhood memories! But, yes, Darkwing Duck was a fun show! If it persists, Dark Waters, you might want to use Darkwing as your avatar! LOL...that would be funny. Kystar wrote: But, yes, Darkwing Duck was a fun show! Also, I really liked your response Dark Waters. Now lets hope that they actually read it and take it in, rather than reading it and sneering at it. Well done! Well, to be truthful, this has turned out to be a hoax. Who's God... for general practices (outside your own place of worship) ... I like the Boys Scouts take on it. i.e. ; My Club soccer team prays before every game (Chris and Jon's U19 Silver). I had various Christians, Jewish, Hindu and Islamic players. All the parents have supported this practice. It's very short and generic prayer, using the term Lord or God (not Jesus). Again, sorry it was a hoax to begin with. THIS may have been a hoax. But the general idea has been introduced, slowly, all over Britain. And, in fact, there HAVE been people taken to court for the new "religiuous hatred" crime for what they have said on T.V or radio. So just because it is a hoax THIS time, don't think it will always be. What happens is that you have the REAL preachers being hurt by the HATE preachers. Then again, did I tell you all about my debate against the Pastor at the Ren. Faire here a few weeks ago? He was causing a major disturbance to all of my friends and the rest of the people there, so I stood on ANOTHER table and put him in his place. O.o It was much like the man annoyingly bugging me at my Tattoo tent at the Art Festival. Even I have a snapping point, I guess. The POINT of this entire digressive response is to note that SOME people are just trying to get attention, and recieve Hate for wide-spread hate. Of course, we must NOT forget the "proffessionaly insulted." The type that are only happy when they have something to complain about. These types pf laws fall RIGHT into their hands.